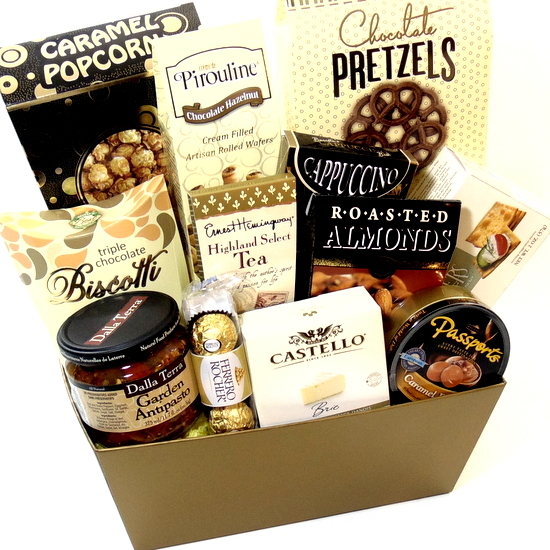 Gold gourmet gift basket is great gift basket to be delivered for any occasion, filled with gourmet food and snacks to enjoy and share. Free Toronto hand delivery. Sympathy, Thank You, Mother’s Day, Happy Birthday, New Home, Happy Anniversary, Love You, Mothers Day, Gifts for her, Gifts for him and many more gift occasions. Gold Gift Basket. Great gift basket delivered for any occasion. Send gourmet food gift basket to Coworkers. Client. Friend. Mom. Dad. Manager. Teacher. Nurse. Doctor. Dog walker. Caregiver. Sympathy. Thank You and many more. 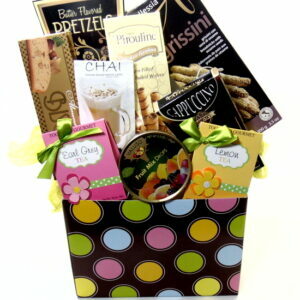 Gift basket contains: Gold open tray gift box. Cheese. Crackers. Sweets. Chocolate. Goodies and snacks all wrapped up in gift basket. 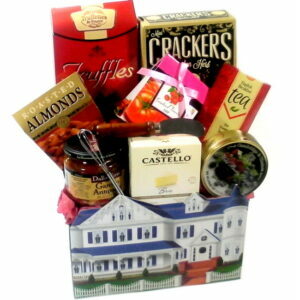 The recipient will enjoy the gourmet food gift basket.